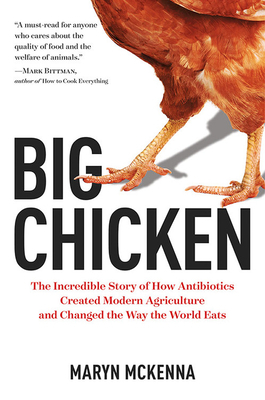 In this eye-opening exposé, acclaimed health journalist and National Geographic contributor Maryn McKenna documents how antibiotics transformed chicken from local delicacy to industrial commodity—and human health threat—uncovering the ways we can make America's favorite meat safer again. What you eat matters—for your health, for the environment, and for future generations. In this riveting investigative narrative, McKenna dives deep into the world of modern agriculture by way of chicken: from the farm where it's raised directly to your dinner table. Consumed more than any other meat in the United States, chicken is emblematic of today's mass food-processing practices and their profound influence on our lives and health. Tracing its meteoric rise from scarce treat to ubiquitous global commodity, McKenna reveals the astounding role of antibiotics in industrial farming, documenting how and why "wonder drugs" revolutionized the way the world eats—and not necessarily for the better. Rich with scientific, historical, and cultural insights, this spellbinding cautionary tale shines a light on one of America's favorite foods—and shows us the way to safer, healthier eating for ourselves and our children. MARYN MCKENNA is an award-winning journalist and the author of two critically acclaimed books, Superbug and Beating Back the Devil. She writes for Wired, National Geographic, Scientific American, Slate, Nature, The Atlantic, the Guardian, National Geographic magazine's online science salon Phenomena, and others, and is a senior fellow of the Schuster Institute for Investigative Journalism at Brandeis University. "Journalist and author Maryn McKenna...describes the consequences of decades spent feeding chicken antibiotics, in terms of chicken flavor, poultry well-being, and, most significantly, human health."